3. Click on the Search Placements drop-down. All of the search parameters are optional. Your search results will be based off of whatever changes you make to the default parameters. 4. Enter a date range that would contain the Start Date of the Placement. 5. Use the Status drop-down menu to select the Placement's status. 6. Select to include/exclude unconfirmed, cancelled, and/or completed Placements. 7. Enter a numerical range that would contain the number of Completed Hours for the Placement. 8. Select an Institutional Advisor. 10. Select a Stakeholder. As you type the Stakeholder's name into the text-entry box, matches in the system will appear for you to choose. 11. Select the Department/Group that contains the Placement. 12. Enter the full or partial Location Name. 13. 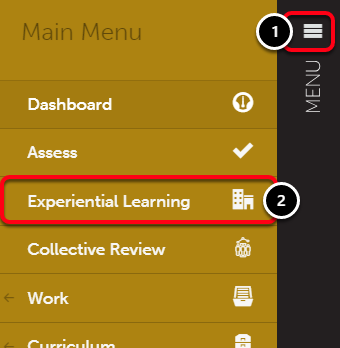 Use the School Type drop-down menu to select the school type. 15. If applicable, search by Custom Fields. 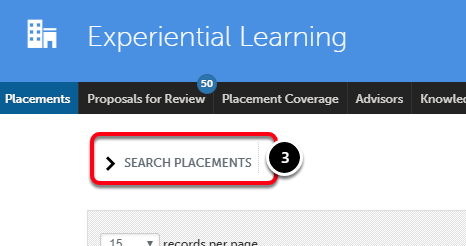 NOTE: Custom Fields will only appear in the "Placements Search" if it was made "searchable" upon creation. 16. Select which columns should appear in your report/search results. 18. Click anywhere on the Placement's row to reveal its options.